This is as much of an institution as the sport itself. 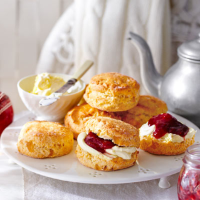 Make scones the centrepiece, along with sandwiches, salad and strawberries.Serve with this deliciously fruity English raspberry and honey fizz. 1. Preheat the oven to 200˚C, gas mark 6. Mix the flour, sugar and salt in a large bowl. Add the butter and, using your fingers, work in until it reaches a breadcrumb consistency. Stir in the lemon zest and make a well in the centre. 2. Mix the stem ginger and lemon juice into the milk. Pour into the flour mixture and, using a knife, roughly bring together. Knead briefly and lightly to combine, then pat out on a surface to about 2cm thick. Cut out 6cm rounds using a pastry cutter – you should make 6, re-rolling any trimmings. 3. Put on a lightly floured baking tray; brush with milk. Bake for 18-20 minutes, until golden; cool. Split and spread with clotted cream, and jam or lemon curd, if liked.